Control the audio screen through the navigation system. 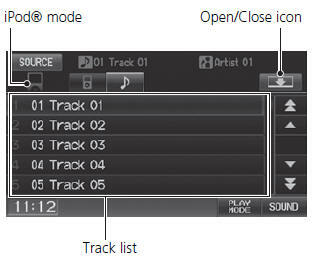 Select the menu tab to change songs in the track list. the track list in random order. the track list in random order by albums. Each song in an album is played in the right order and only the order of albums is randomized. : Displays the sound preferences screen. : Changes the source mode. To stop repeat- or shuffle-play, select the current play mode button again.